Racingbreaks are Europe's largest racing travel business, offering ticket inclusive and hospitality packages to all major UK and Ireland racecourses including Cheltenham, Aintree, Punchestown, Newmarket, Leopardstown, Chester, Epsom, The Curragh, Ascot, Goodwood and York. We also offer international horse racing abroad packages to Meydan in Dubai Longchamp, Chantilly, Keeneland, Santa Anita, Kentucky and Melbourne. With tens of thousands of race goers travelling with us annually, you are guaranteed the very best price and service for your race day or break. To redeem your voucher please call Racing Breaks on 0800 193 6646 and quote your voucher code number. All gift vouchers are valid for 12 months from date of purchase. 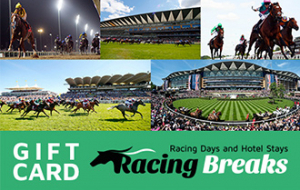 Gift cards can be used against any ticket or package on the Racing Breaks website. Gift vouchers can not be used directly at the Racecourse or hotels.